1) The W.A.S.A. Award is issued from A.R.I. - Diamond Dx Club for O.M. and S.W.L. 2) The minimum requisite for obtaining the award is to have confirmed 10 different Stations operating from Antarctic Continent. 3) Contacts on all ham radio bands, from 2 to 160 meters, and in the SSB, CW, RTTY, EME and SAT modes are valid. There is not differentiations of mode or band. 4) There are not limits on signal reports received on SSB, CW, RTTY, EME and SAT. 5) Contacts with stations in Antarctica are valid since January 1st.1961 (the year of the "Antarctic Treaty"). The Antarctica territory start from 60� degrees South Latitude. b) QSL cards for the contacts listed. Note: Diamond Dx Club members do not need to send QSLs, but must have them on hand for eventual checking. The QSLs will be returned to applicant via the bureau unless return postage is enclosed with the application. c) The award fee is 15� or $15,00 US. d) The endorsements fee is Lit.3,000 or $ 2,00 US each. The Award Manager of Diamond Dx Club is: Sezione A.R.I. Napoli, c/o I8YRK, Casaburi Gennaro, Via 31 maggio 11, I-80027 Frattamaggiore (NA) Italy, to whom applications have to be sent. 7) The possessors of the W.A.S.A. can use this title on own QSLs and in correspondence. 8) The Italian Official A.R.I. Magazine "Radio Rivista", will publish twice a year up to date of results with call-signs and names of the new W.A.S.A. awards issued. 9) The Honor Roll W.A.S.A. is free for who have 100 different Stations in Antarctica confirmed and got all endorsements. 10) The W.A.S.A. award consist of personalized plate (200x250mm in size), five colour showing the Antarctic Continent. 11) The W.A.S.A. Honor Roll award consist of personalized plate (160x200mm in size), five colour showing the Antarctic Continent. The attainment of the last endorsement will be winning the last sticker "W.A.S.A. EXCELLENCE". 13) The stickers "W.A.S.A. Honor Roll 100 Stations" and "W.A.S.A. Top Honor Roll 200 Stations" are free. 14) Copy of "Antarctic Bases Directory of W.A.B.A. and W.A.S.A." (pages 53) is available from Sezione A.R.I. Napoli, c/o I8YRK, Casaburi Gennaro, Via 31 maggio 11, I-80027 Frattamaggiore (NA), Italy. The fee is Lit.18,000 or $11,00 US, as contribution for postal expences and photocopies. 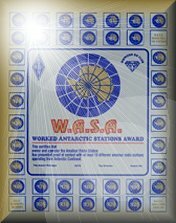 15) The Radio Amateurs that active or have actived a base in Antarctica, has right to apply automatically the W.A.S.A. award without to enclose QSLs and log extract. 16) Contacts with special call IN0G, IR1ANT, IY0A and IY8UN (IR8ANT contact made after 20 April 1996), IR2A, IR2ANT are also valid for the award; these 6 stations can be used once only like Joker, both for obtaining the award and the stickers of endorsements. 17) Anyone have information about Antarctic Stations not enclosed on the Directory, could get in touch or write to I8YRK; helpers own calls will be mentioned on first page of the Directory like contributor. 18) There is not limits for up to date.